Andy Peaks knows AFC Rushden & Diamonds face a “totally different game” this weekend after hitting a new height with their win at Leiston last Saturday. Diamonds claimed a superb 4-1 victory in Suffolk to maintain third place in the Evo-Stik League South Premier Division Central. Peaks felt it was the best performance during his near five-year reign as manager but he insists Diamonds will have to raise things once again when they head to Alvechurch this weekend. “We had a game plan at Leiston and the boys stuck to it and produced an excellent display,” he said. “I said it at the time and I stand by it, I think that was the best we have been since I have been here. “We are enjoying the position we are in but we know it will be a totally different game with totally different tactics this weekend. 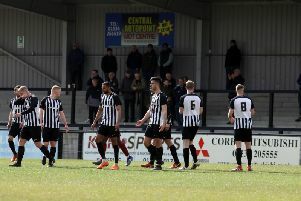 Peaks was particularly delighted with the contributions Alex Collard and Matt Berry-Hargreaves after they were thrown together at the heart of the defence following their arrivals at the club last weekend. The Diamonds boss made the moves for former Kempston Rovers defender Collard and Berry-Hargreaves, who has joined Oxford United team-mate Albie Hopkins on loan at Hayden Road, with Liam Dolman and Jack Ashton both on the sidelines due to injury. And Peaks added: “Alex is one we have been looking at for a while and, with Matt, we are delighted that Oxford have helped us out again. I think they are happy with what we have done with Albie. “We got them into training last Thursday and Lamby (assistant-manager Paul Lamb) put on a great session with what was a new-look back four. Diamonds will be without Jack Westbrook who serves the last of a three-match ban while forward Ben Diamond sits out due to a one-game suspension.